When I think of denim, the first thing that comes to mind is a great pair of jeans. If you're the same way, you might want to rethink denim this spring. It's coming at ya' in the form of jewelry, dresses, skirts, shoes, and jackets. Are you ready? 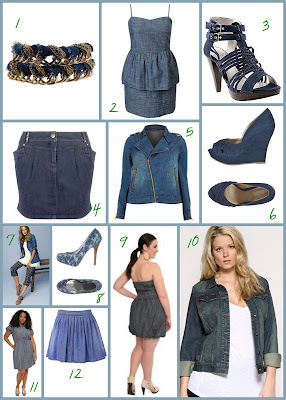 **My fave is #2 the Denim Allure Dress by F21. I wanted to buy it this weekend but they only one left and it was too small! My golden rule: Don't do denim head to toe. Add one piece and work around it. You don't want to look like a denim factory threw up on you!